Barrett Astin – RHP – Arkansas – Jr. 6IP 2H 0ER 1BB 5K. Closer last year. Colby Suggs – RHP – Arkansas – Jr. .1IP 1ER 3BB 1K. Daniel Gibson – LHP – Florida – Jr. .1IP 1H 0ER 0BB 1K. Tyler Beede – RHP – Vanderbilt – So. 7IP 2H 1ER 1BB 9K. (W, 2-0). Unsigned 1st round pick in 2011 (TOR). Jordan Montgomery – LHP – South Carolina – So. 5IP 5H 2ER 3BB 5K. (W, 2-0). Mike Mayers – RHP – Mississippi – Jr. 6IP 2H 0ER 3BB 4K. Daniel Mengden – RHP – Texas A&M – So. Jimmie Sherfy – RHP – Oregon – Jr. 1IP 1H 0ER 1BB 1K. Nick Vander Tuig – RHP – UCLA – Jr. 6IP 4H 2ER 1BB 3K. (L, 1-1). Wyatt Strahan – RHP – Southern Carolina – So. 6.1IP 3H 0ER 3BB 7K. Carlos Rodon – LHP – NC State – So. 7IP 0H 0ER 1BB 14K. (W, 1-1). Projected 2014 1st overall pick. Kent Emanuel – LHP – North Carolina – Jr. 7IP 4H 1ER 2BB 8K. (W, 2-0). Brandon Leibrandt – LHP – Florida State – So. 6IP 5H 3ER 2BB 5K. (W, 2-0). Buck Farmer – RHP – Georgia Tech – Sr. 7IP 4H 0ER 0BB 7K. Unsigned 15th round pick in ’12 (MIL). Daniel Gossett – RHP – Clemson – So. 5IP 6H 1ER 2BB 6K. (W, 1-0). 2014 Draft Prospect. Jonathan Gray – RHP – Oklahoma – Jr. 7IP 4H 1ER 4BB 6K. (W, 2-0). Dillon Peters – LHP – Texas – So. 6IP 6H 1ER 1BB 4K. Chad Hollingsworth – RHP – Texas – Fr. 0.1IP 0H 0ER 0BB 0K. (W, 2-0). 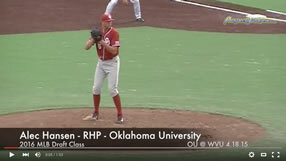 Jason Hursh – RHP – Oklahoma State – So. 7IP 4H 1ER 0BB 5K. (W, 1-0). Jeff Thompson – RHP – Louisville – Jr. 6IP 4H 0ER 3BB 5K. (W, 2-0). Dan Slania – RHP – Notre Dame – Jr. 1IP 0H 0ER 0BB 0K. Conor Krauss – RHP – Seton Hall – So. 1IP 3H 2ER 1BB 2K. Jordan Stephens – RHP – Rice – So. 9IP 4H 0ER 1BB 10K. (W, 1-1). Justin Garza – RHP – Cal State Fullerton – Fr. 7.1IP 5H 1ER 0BB 5K. (W, 2-0). 26th round pick (CLE) in 2012. J.D. Davis – RHP – Cal State Fullerton – So. 1.2IP 1H 0ER 0BB 2K. (S, 1). Matt Imhof – LHP – Cal Poly – So. 6IP 3H 0ER 2BB 9K. Derick Velazquez – RHP – Fresno State – So. 7IP 8H 2ER 1BB 3K. Dylan Covey – RHP – San Diego – Jr. 5IP 3H 0ER 3BB 2K. (W, 1-1). Alex Balog – RHP – San Francisco – Jr. 7IP 4H 1ER 2BB 4K. (W, 1-0). Tyler Olson – LHP – Gonzaga – Sr. 8IP 8H 3ER 2BB 8K. (L, 1-1). Trevor Megill – RHP – Loyola Marymount – So. 6IP 1H 4ER 2BB 8K. (L, 1-1). Travis Radke – LHP – Portland – So. 6IP 6H 5ER 1BB 10K. John Beck – RHP – Texas Arlington – Jr. 6.2IP 6H 4ER 2BB 2K. (L, 0-1). David Garner – RHP – Michigan State – Jr. 5IP 8H 5ER 2BB 4K. Joshua Uhen – RHP – Wisconsin Milwaukee – So. 1IP 1H 0ER 2BB 1K. Taylor Williams – RHP – Kent State – Jr. 7IP 8H 3ER 0BB 8K. (W, 1-0). Sam Coonrod – RHP – Southern Illinois – So. 4IP 1H 2ER 6BB 0K. Nick Petree – RHP – Missouri State – Jr. 7IP 5H 1ER 4BB 7K. (W, 1-0). David Ernst – RHP – North Dakota State – So. 6IP 8H 3ER 1BB 4K. (W, 1-1). 47th round pick in 2011 (CHC). Anthony Bazzani – RHP – Eastern Kentucky – Sr. 5IP 4H 1ER 2BB 5K. (W, 1-1). Dan Tobik – RHP – Tennessee-Martin – Sr. 5IP 5H 2ER 2BB 7K. Aaron Goe – RHP – Morehead State – So. 6Ip 7H 2ER 0BB 2K. (L, 1-1). Cody Dickson – LHP – Sam Houston State. – Jr. 9IP 7H 2ER 1BB 9K. (W, 1-1). Jeff Enloe – LHP – Central Arkansas – Sr. 9IP 10H 2ER 1BB 10K. (W, 2-0). Tylor Byrd – LHP – Nicholls State – Jr. 6.2IP 5H 3ER 5BB 10K. (W, 2-0). Jose DeLeon – RHP – Southern – Jr. 4.2IP 4H 3BB 4K. (L, 0-2). Hunter Adkins – RHP – Middle Tennessee St. – Sr. 8IP 3H 1ER 3BB 5K. (W, 2-0). Fantastic performance against Auburn. Chance Cleveland – RHP – Arkansas Little Rock – Sr.8IP 3H 0ER 1BB 8K. (W, 1-1). Hunter Brothers – RHP – Lipscomb – So. 5.1IP 4H 2ER 4BB 2K. Travis Dean – RHP – Kennesaw St. – Jr. 4.2IP 5H 3ER 2BB 5K. A 14th round pick (NYY) in 2010 and in the 22nd round (TEX) in ’12. Last year I began working on my first mock draft 6 months before the draft date while this year I started less than 24 hours before commencement. Though I told myself I wouldn’t be mocking this year, I couldn’t resist the urge to throw in my two cents. This mock draft is to be used for recreational purposes only. Do not drive or operate heavy machinery after reading. 1. Houston Astros: Mark Appel – RHP – Stanford. The 6’5″ Appel was last drafted by the Detroit Tigers in the 15th round in 2009. Though not a true #1 in my opinion, Appel has more polish than last year’s top pick (Gerrit Cole). 2. Minnesota Twins: Byron Buxton – OF – Appling Co. HS (GA). The 5 tool Buxton emerged as the top prep prospect in last year’s summer showcase circuit and did nothing this spring to diminish his status. 3. Seattle Mariners: Mike Zunino – C – Florida. Zunino, last year’s SEC player of the year entered the season as the top college position player and helped his Gators enter the post season as the top team in the nation. 4. Baltimore Orioles: Kevin Gausman – RHP – LSU. The draft eligible sophomore was last drafted by the Dodgers in the 2010 (6th Round). San Francisco’s Kyle Zimmer is another possibility. 5. Kansas City Royals: Kyle Zimmer – RHP – San Francisco. Technically sound Zimmer was not drafted out of high school and would be the top player in the board at this point. Royals will jump on previous 4 if they fall. 6. Chicago Cubs: Albert Almora – OF – Mater Academy (FL). Profiles well as an outfielder to hit for both average and power. Prep SS Carlos Correa is another possibility. 7. San Diego Padres: Carlos Correa – SS – Puerto Rico Baseball Academy. One of my favorite prospects in this draft because of his size (6’3″ 185) and age (17), Correa will likely outgrow SS but should be a fine defensive 3B. 8. Pittsburg Pirates: Chris Stratton – RHP – Mississippi State. Undrafted out of high school, all Stratton has done this year is go 11-2 with a 2.38 ERA. If Stratton doesn’t come off the board here, he may slide to the White Sox or Reds at 13 or 14 respectfully. 9. Florida Marlins: Andrew Heaney – LHP – Oklahoma State. If not Heaney, i think the Max Fried slide stops now. 10. Colorado Rockies: Courtney Hawkins – OF – Carroll HS (TX). Toolsy outfielder is a scouts dream and will be a sabrmatician’s nightmare his first few years in the minors. I see a high K rate and a corresponding low average. 11. Oakland Athletics: Max Fried – LHP – Harvard-Westlake HS (CA). The A’s have a lot of picks and a lot of money to spend. Fried and teammate Lucas Giolito (RHP) will both come off the board in the first round but are both wildcards as to where. 12. New York Mets: David Dahl – OF – Oak Mountain HS (AL). Met’s are still a wildcard at this pick. Wouldn’t be surprised to see college pitchers Michael Wacha or Chris Stratton. 13. Chicago White Sox: Marcus Stroman – RHP – Duke. Wishful thinking here for this White Sox fan but the Sox ARE linked to college arms if they don’t over pay for injured Solon HS (OH) LHP Matt Smoral. Stratton, Michael Wacha and Andrew Heaney are possibilities. 14. Cincinnati Reds: Michael Wacha – RHP – Texas A&M. The Reds, like the White Sox, are linked to college arms and could go with Stratton, Wacha or Stroman as well. Arizona State SS Deven Marrero would make a ton of sense here too and Reds fan should be thrilled to get him. 15. Cleveland Indians: Richie Shaffer – 3B – Clemson. Stanford’s Stephen Piscotty or one of the college arms above are also possibilities. 16. Washington Nationals: Deven Marrero – SS – Arizona State. This has got to be the end of the slide for Marrerro who could go as high as #4 to Baltimore. 17. Toronto Blue Jays: Lucas Giolito – RHP – Harvard Westlake HS (CA). The Jays are well positioned to take a flyer on an elite talent with health issues such as Giolito or Matt Smoral. 18. Los Angeles Dodgers: Ty Hensley – RHP – Santa Fe HS (CA). The Dodgers have a history of taking prep pitchers in the first round. 19. St. Louis Cardinals: Lance McCullers Jr. – RHP – Jesuit HS (FL). Considered a tough sign, the Cardinals can afford to pony up. Leading publications have them linked to prep SS Addison Russell. 20. San Francisco Giants: Brian Johnson – LHP – Florida. Johnson, the two way star, could either land here or slide to the supplemental round. 21. Atlanta Braves: Tanner Rahier – SS – Palm Desert HS (CA). Advanced hitter has been swinging wood bats the past two seasons. 22. Toronto Blue Jays: Gavin Cecchini – SS – Barbe HS (LA). I get the sense that he’s going to be the next Marco Scutaro, for what it’s worth. 23. St. Louis Cardinals: Stephen Piscotty – 3B/OF – Stanford. Recently moved to the outfield as well as the weekend rotation, I suspect he’ll play 3B as a professional. 24. Boston Red Sox: Joey Gallo – 3B – Bishop Gorman HS (NV). 25. Tampa Bay Rays: D.J. Davis – OF – Stone County HS. Davis is the fastest runner in this draft. 26. Arizona Diamondbacks: Stryker Trahan – C – Acadiana HS (LA). Keith Law compares him to Wil Myers. If he’s half that, he’s a steal here. 27. Milwaukee Brewers: Clint Coulter – C – Union HS (WA). 28. Milwaukee Brewers: Addison Russell – SS – Pace HS (FL). 30. New York Yankees: Matt Smoral – LHP – Solon (OH). An injured foot cost me my opportunity to see him pitch this year. Still a 1st round talent. 31. Boston Red Sox: Pierce Johnson – RHP – Missouri St.